Dorm Co. Tip: Wooden shelving adds to dorm room decor while providing a shelf cover to adjustable shelving! Your college dorm room won't have a designated dining table and your dorm desk may not have enough space for you to work. However, you're also in a small college dorm room, so adding another large table won't work. Like your other dorm essentials, you need to think compact. For a portable dorm table that is also compact and specially designed for the college dorm room, add our Go Anywhere Desktop in Black Walnut. Our Go Anywhere Desktop in Black Walnut has the ability to be easily moved throughout your dorm room so you can have additional table space when you need it. In a dark black walnut color, this dorm item will even add to your dorm room decor! The adjustable height of the table allows you to sit comfortably whether at your dorm bed or your dorm desk. 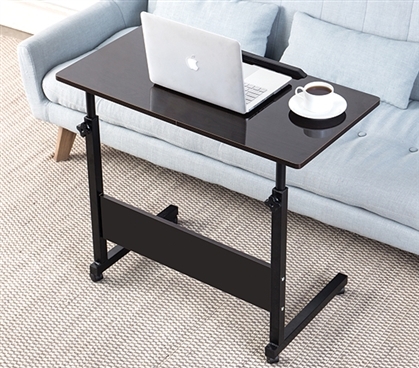 Pull it up to your dorm bed for a table to eat your breakfast, lunch, or dinner at or even set your book or laptop on it while you study at your dorm bed. Pull it up to your dorm desk for additional table space so you can have your college textbook open on this dorm essentials item while you have your laptop and notebooks set up on your dorm desk. Study more efficiently with our Go Anywhere Desktop in Black Walnut!